Imagine a trip to southern Spain, where music echoes through the streets of ancient cities. The sound of a guitar cascades down from an open window, and a glance upward reveals iron balconies filled with flowers, plants and clay pots. A park bench may quickly become a gathering place for rhythm, song and dance. Human connection is the center of everyday life. The region is Andalusia, and the music is flamenco. Every Saturday in October and November you can catch a glimpse of this world, at 8 p.m. at Scottsdale Center for the Performing Arts’ Stage 2. The show, “Flamenco Intimo,” features Julia Chacón’s Flamenco Theater (formerly Inspiración Flamenca) offering eight distinct shows peppered with guest artists from near and far. Flamenco is the dance, guitar technique and song forms of southern Spain. An intricate art form, the dance features rapid footwork, spiraling arms and dynamic costumes. The guitar incorporates complex finger techniques and the singing is highly expressive. Director/Dancer, Julia Chacón trained and performed in Madrid and Seville, Spain, and toured the United States and abroad with international dance companies for 10 years. Chacón is Phoenix native who returned to the Valley in late 2013. This is not Chacón’s inaugural year at Scottsdale Center for the Performing Arts. 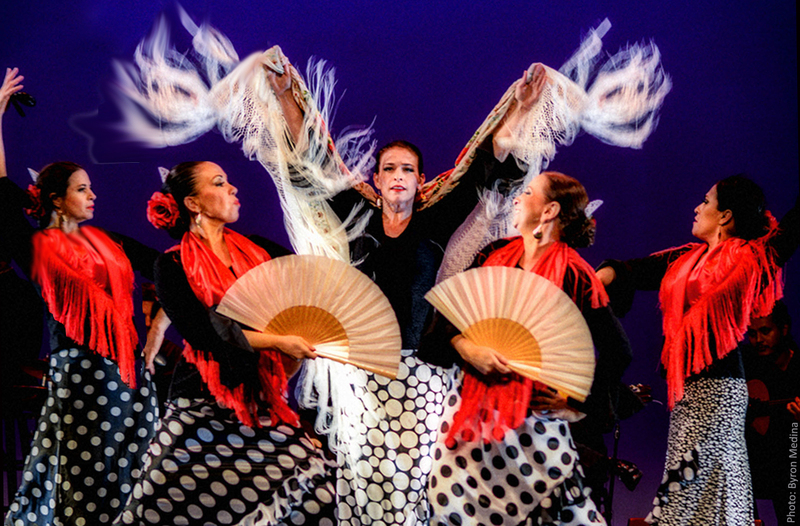 First in 2015 and subsequent years since, Chacón’s company Inspiración Flamenca filled the Virginia G. Piper Theater, earning standing ovations from the largest crowds of the Live & Local summer series. Since 2015, Chacón’s company has also sold out three concerts at Peoria Center for the Performing Arts; was twice chosen as a Top Ten Event in Phoenix magazine; was featured in Images Arizona magazine and the Arizona Republic; and appeared on KTVK-3TV and Fox 10. In 2016, Chacón presented at TedxLSU with musician Kristofer Hill. This upcoming two-month run in Scottsdale will be the first flamenco theater series in the Valley. Chacón’s career as a soloist with María Benitez Teatro Flamenco, Carlota Santana’s Flamenco Vivo and the Cuadro de José Galvan in Seville had her performing with elite artists such as Andres Peña, Chuscales, Tudela and Inmaculada Ortega. She founded the dance company Inspiración Flamenca in Santa Fe, New Mexico in 2008, and changed the name to Flamenco Theatre this year. The upcoming show features choreography and performance by Chacón, Carlos Montufar and Martin Gaxiola (founder of Caló Flamenco). A dynamic ensemble of international dancers and musicians will also be featured, including Greek pianist Ioannis Goudelis, who has opened for Stevie Wonder and appeared on Jimmy Kimmel Live, dancer Leilah Broukhim from Madrid, and international award-winning guitarist, Misael Barraza from Mexico. The audience may enjoy a full bar and light fare in the theater, which will have a mix of bistro tables and theater seating. The concert begins at 8 p.m. When: Saturdays in October and November, 2018, at 8 p.m. Drinks and light fare available. Tickets: $18 to $22, reserved, www.ScottsdalePerformingArts.org or 480-499-TKTS (8587). Previous postFlamenco Workshop with Alejandro Granados in Scottsdale.